The value of trust is something I consider nearly every day. As I raise my children, we often talk about trust – how to build it and how it can be broken. The durability of nearly every long term relationship can be measured by the strength of trust. A breach of trust can end business partnerships, friendships, and marriages. When we stop and take time to evaluate the role of trust, the conclusion must be that it is one of the most precious commodities we can cultivate. How do we build trust? On one hand, the formula looks simple – say what we mean and do what we say. We make a promise and we keep a promise. Some are grand like wedding vows. Some are simple like packing a string cheese in our kids’ lunchbox after saying we would the night before. Building trust is similar to building a large structure – we must lay a foundation. In personal relationships it might start by agreeing on a time when we’ll pick someone up for a meal and being there at the specified time. What seems in the moment like a simple act can be the cornerstone of the trust we hope to build. Ten years later, the same friends might be watching each other’s children so the others can go out to dinner. We don’t trust each other with what we hold most precious if we can’t trust each other with life’s simple things. 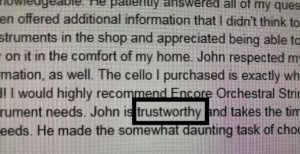 All of this is why the deepest compliment someone can pay us here at Encore and Paige’s is describing us as trustworthy. Worthy of trust. We make a promise and we keep it. We say what we mean and do what we say. It starts small and simple with a string delivered to school. It grows with advice about whether or not it’s time to search for a better instrument. We spend time talking about what summer program might be best and it grows to what colleges might be the best fit. Before long we find ourselves sitting with our customers, sipping a cup of coffee, talking about an exciting professional opportunity or a particularly challenging life struggle. If you don’t know us, we invite you to allow us to earn your trust. If you do know us, we want to continue to build your trust. This the heart of why we do what we do. John Rihani on New hair for your bow?